Custom Printed Glossy Sunglasses are available in Black, Yellow, Orange, Lime Green, Purple, Pink, White, Red and Reflex Blue. Glossy PC plastic frames and UV400 lenses are other major characteristics of these custom fun sunglasses. They have an overall dimension of 5.875" W x 1.875" H x 6" D and are featuring 1.75" W x .25" H imprint area. Best for events like parties and celebrations, make your order for these imprinted new arrival sunglasses right now to earn free online proofs, free design and lowest price guarantee offers. 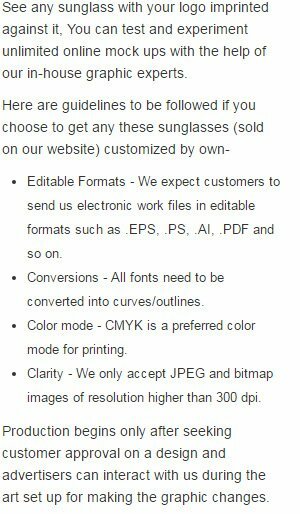 Request a quote to know savings that you can pocket on bulk ordering these Custom Printed Glossy Sunglasses. Additional Information: Ultraviolet protection level UV400 (100% UV).